The Cazenovia Canning Company was founded in 1904 by Henry Burden in the upper floors that also housed the Cazenovia Electric Company. It provided a market for locally grown vegetables and employed up to 150 persons seasonally. Many of these employees were Italian migrant workers who resided in bunk houses on the premises. In addition to local farmers bringing crops to the factory, the Cazenovia Republican in 1915 reported that the Company planted 141 acres of beans with workers picking 21,500 pounds of beans in one day. During WW1, canned vegetables were a staple of the servicemen’s diet. 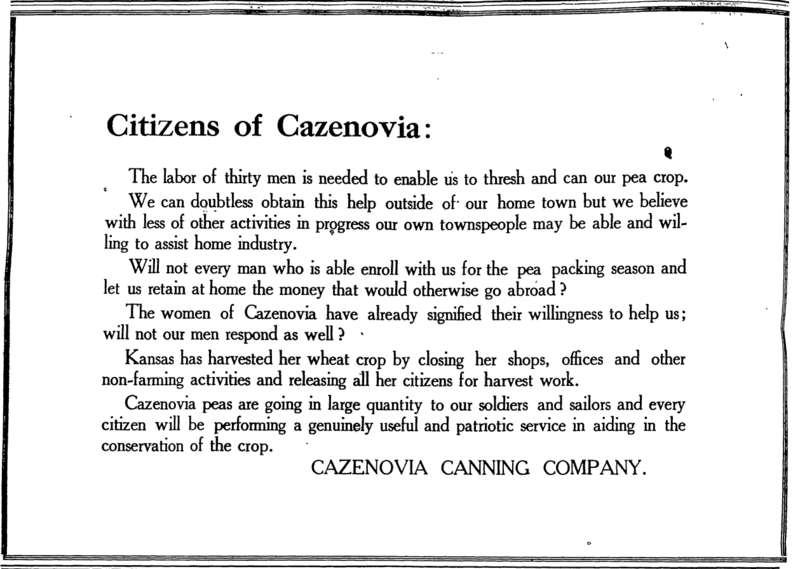 Cazenovia Canning Company was granted contracts by the quartermaster department of the U.S. Army to supply the troops.Helping to harvest and can Cazenovia’s vegetables was considered a patriotic duty. (see attached ad) After the war and with the introduction of refrigerated railroad cars that could safely transport fruits and vegetables, the demand for canned goods declined. The factory was closed in 1928. The first mill to be developed on the site of the future Canning Company was the Sweetlands Paper Co. which was established in 1810. The mill operated until 1870 when it was destroyed by fire. In 1875, Joseph F. Crawford, who had invented and patented the first reversible mower for harvesting crops, began the construction of a new mill to help meet demand for his popular mower. Well known Syracuse architect Archimedes Russell was engaged to design a structure large enough to house 200 workers; they were able to complete one machine every twenty minutes. Crawford Mower Works operated from 1876 until 1890. The mill then housed the Bently Shoe Co. and the Union Electric Co. before being purchased by Mr. Burden. The entire structure was completely destroyed by fire on August 15, 2001. Remnants of the foundation are all that remain of the large mill. “Little Italy Settlement Attracts Much Attention”. Cazenovia Republican. 12 August 1915.